On the assignment map I slapped down a post-it note to claim Pontiac street from Patricia on eastwards. 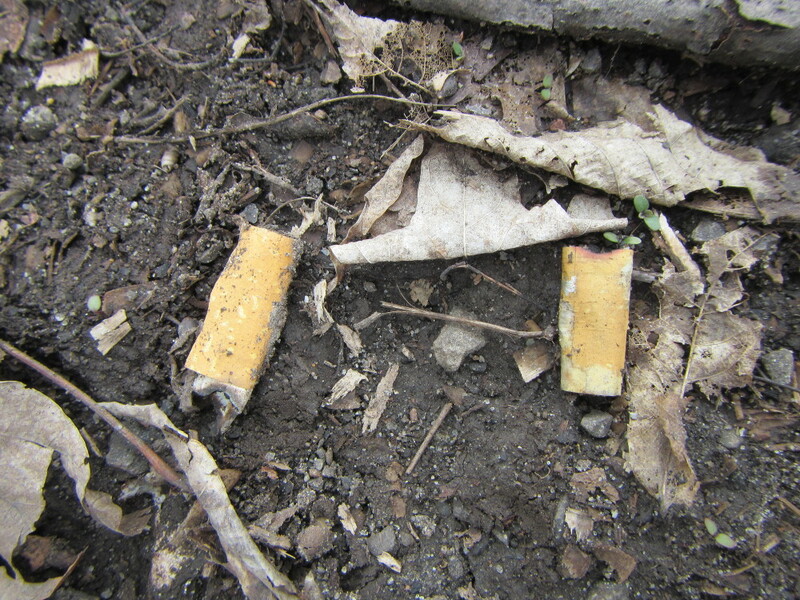 Of course, being next to the school and at a secluded corner, there was lots of litter, starting with zillions of cigarette butts. There were also dumped piles of construction debris, next to a car with someone sleeping in it. 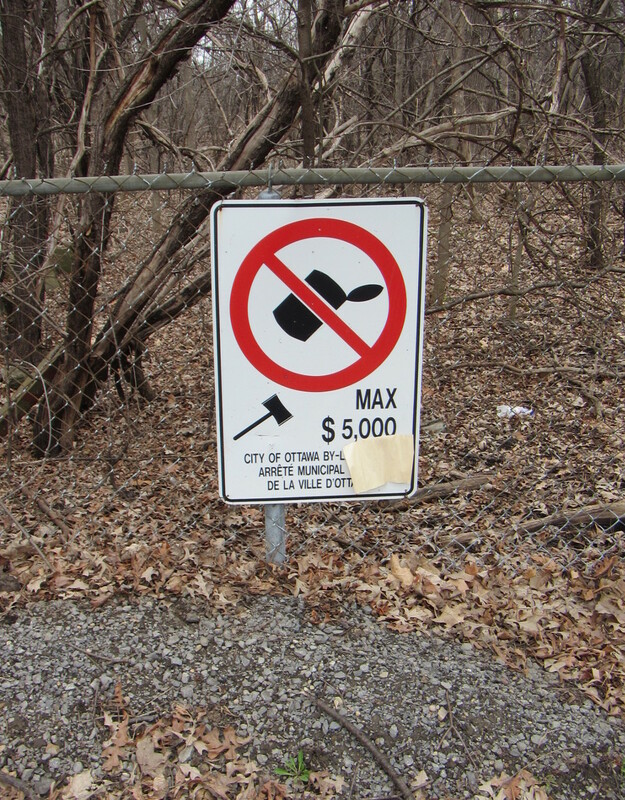 Ironically, a few metres away was a sign about not littering. 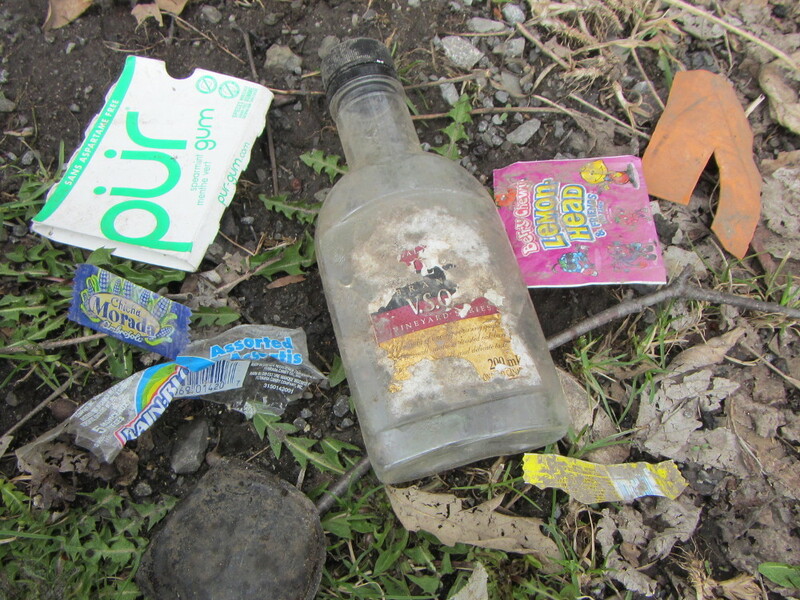 Typical of the school area were candy wrappers and plastic bottles of cheap brandy (I found two, other people in other areas found more, and a passing dog walker reported finding similar stuff (and cleaning it up) on their daily expedition). I also found some blue earbuds, an eye safety visor, a large plastic flower pot, broken glass bottles of assorted types, a pile of hair (apparently it doesn’t biodegrade quickly), a downed telephone line, and assorted bits of paper. There’s lots more garbage remaining in the woods on the other side of the fence, since I only had time to do the road side up to the gate to the forest path. 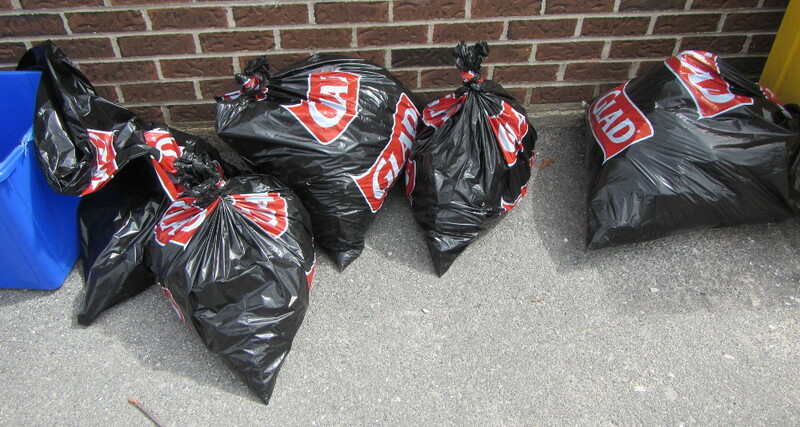 After a couple of hours out in the nice cool sunny weather, everyone brought their garbage bags back to the fieldhouse. 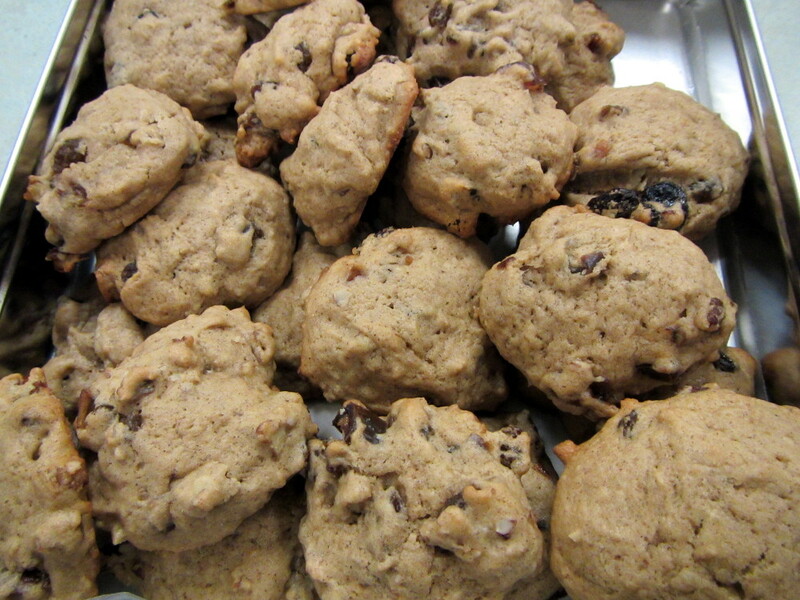 Each one contains debris from a block or two of street. I stuck around for a bit of snacking and chatting at the fieldhouse, and then it was time to go home. Thanks go to Andrea and Ian for organizing it. This entry was posted in Spring Cleanup. Bookmark the permalink. Well done, everyone. It’s a nasty, sometimes dangerous job, but you did it, did it well, and with humour. I would like to thank Ian and Andrea for organizing, Debra for adding to the fun with her costume, and everyone who participated in the Spring Clean-Up, on behalf of the CPCA executive! Thank you, Alex, for noting my presence at this event. I was wearing the tree mascot that a group representing tree protection advocates from community associations in Kitchissippi Ward created this spring. The mascot represents a mature, healthy tree that nobody wants to cut down! 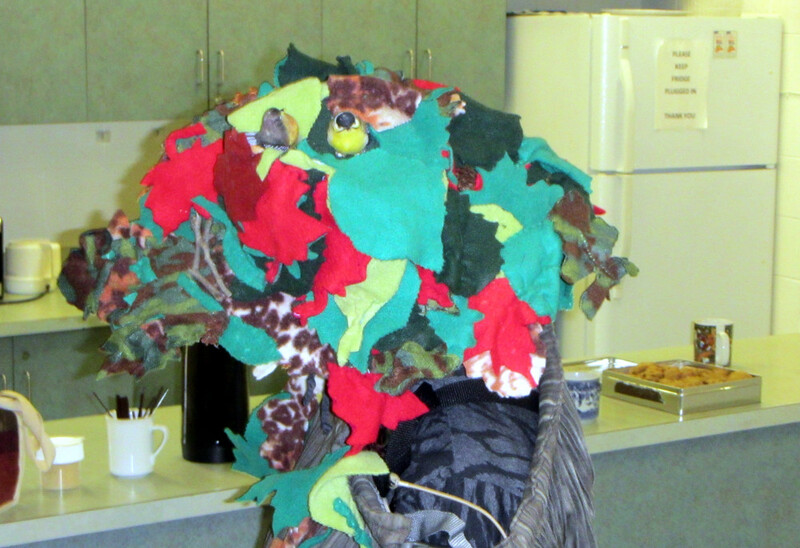 If members of the Champlain Park CA wish to use the tree mascot for events, they may ask to borrow it from me. Get your membership card during the spring membership canvass, or help to do some canvassing yourself! Contact me 613 859-8049. Many thanks to Champlain Park CA and Westboro Beach CA for funding creation of the mascot, and to to Catherine Shearer and Linda Landreville of Champlain Park for putting in long hours sewing the mascot. Helpers from various community associations also lent a hand.